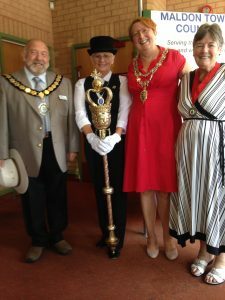 This year saw a historic change for Maldon Carnival with the traditional `carnival week’ being extended to a fortnight. It started on 21st August with the crowning by the Town Mayor of the Carnival Queen and her court, and finished two weeks later with the carnival procession. On the day of the procession the Town Mayor hosted lunch at the Town Hall which was attended by several visiting Mayors.